Fruits are really important for your everyone’s diet. These Top 10 Reasons Why You Need To Eat Fruit will make you run to the supermarket to buy more fruit. The health benefits are truly amazing. 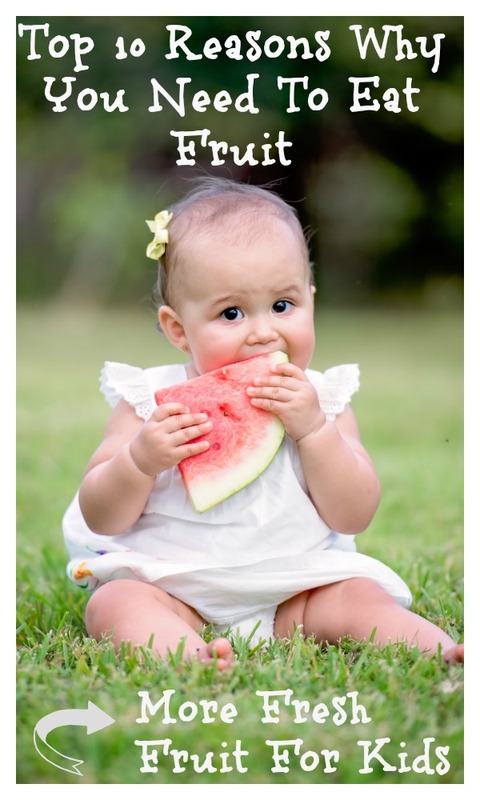 Babies, kids, and adults should eat fruit everyday and make it a habit. A good healthy habit. Fresh fruits are a great option for breakfast, snack or dessert. Most fruits are sweet and ready for you to eat without cooking or preparing a recipe. Take an apple, a peach, or a banana and just enjoy. Remember to always have fresh fruit available at home. If you have good choices available, you will make good choices. Children are now eating highly processed snacks that are nutritionally poor and a threat to their future health. These products are loaded with artificial colors, flavors, refined sugars and are super high in calories. Kids are eating more refined sugars than ever before. The Center for Disease Control and Prevention’s statistics are alarming. By 2050, 1 in 3 people will have diabetes. You can improve and change that by switching many of these unhealthy snack options for fruit and homemade recipes. Eating more fresh fruit will help you stay away from processed food. Fruit comes from nature not a factory. The closer to nature, the better for your health. 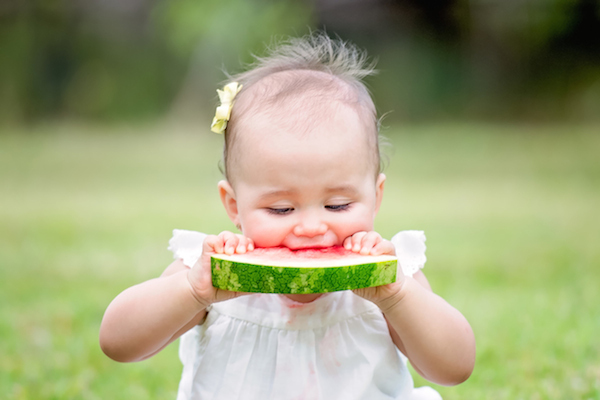 Fruits are naturally low in fat, calories, and have key nutrients that your child needs to grow. Fruit helps protect you from illnesses. 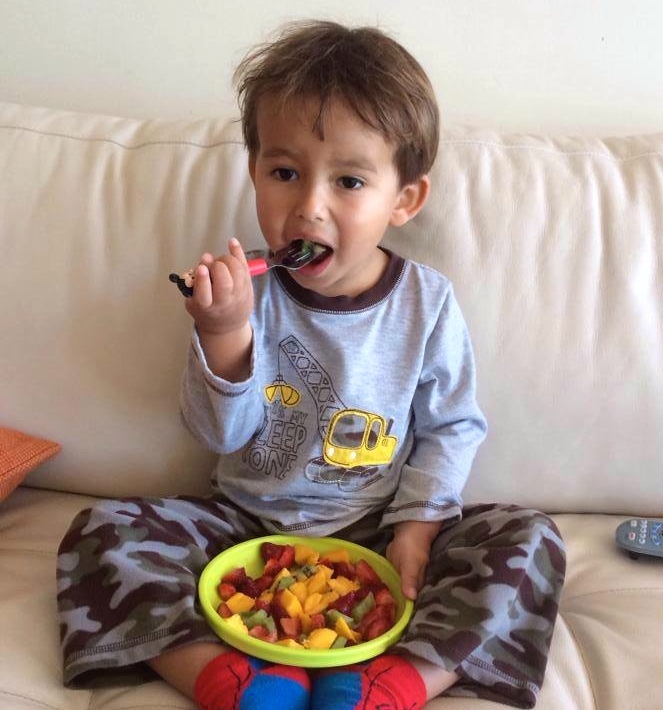 Here is a picture of my son having a fruit salad for breakfast. There is nothing better than starting the day with fresh fruit straight from nature. Kiwi, mango and strawberries. Yummy! Offer variety and please don’t give up if your child is picky with certain fruits. It takes time to accept a new flavor. My son did not like kiwi until the 10th or 11th time I offered it to him. It is now one of his favorite fruits. Eating more fruit yourself will make you a good role model for your kids. I am now eating more fruit than ever before because I want to teach my kids healthy eating habits. You will have more credibility when you tell them to eat an apple instead of a cookie if you have an apple in your hand. Remember children are great imitators. My kids both love fruit and I make sure they have 1-2 servings per day. Start early when they are babies and create healthy eating habits. Did you know that eating plenty of fresh fruit might also boost your child’s performance in school? A 2008 study published in the “Journal of School Health” notes that a diet rich in fruits and vegetables results in higher test scores. A healthy diet that includes fruit can also increase your child’s focus in the classroom so he is able to learn new information, as well as retain what he’s learned. That’s really amazing! Eating fruit provides many health benefits and people who eat more fruits are likely to have a reduced risk of some chronic diseases and cancer. Now that I eat more fruit I can see my skin glowing, I have more energy, and I feel better. Fruits provide nutrients that are vital for health and maintenance of your body. If you want more ideas for other healthy fruit options, please see my Fruit Pops ideas or an easy to make Homemade Healthy Gummies recipe. You can make your own healthy gummies and turn an unhealthy snack into a nutritious and perfect treat. Remember that you are in charge of buying the groceries and your kids will eat what’s available in your kitchen. Always have fruits available for healthy snacks. If you have another great fruit recipe, please share it with me. I am always looking for new creative and healthy fun fruit recipes. Hi Ursula,Thank you ever so much for all the information on fruits for healthy family.i liked so much and would like you to send me more such information so that I could translate it in my mother language and organize a periodical campaign for mothers and their young children. With the best of my regards and thanks to you. Fresh fruits are a great option for breakfast, snack or dessert. Most fruits are sweet and ready for you to eat without cooking or preparing a recipe. When i was 16 I stopped increasing my height.So my height was 160 cm and I could have grown more if I wasn’t eating so much of Fast Food.So,I was always conscious about my kids health and made them eat fruits and healthy diet till 16. Though they had bit fast food may be once a week but I made them health conscious since childhood as I always wanted my kids to be heighten and healthy.I am proud that my daughter is 170 cm at the age of 17 and my son is 182.88 cm at 19. Healthy diet really benefits the body. Wow! That is great! Diet is really important. Thank you for sharing your story. I’m a believer in fruits and veggies . However, I see the “diet” people discouraging fruit because it has sugar . So what do they do? Oranges are bad for you so I have been told. Then they take supplements to get their vitamins. Let them eat their chicken breast a day and half cup of broccoli. I just hope they allow their children a healthy balanced diet. When I suggested fruit for a relative’s child, I got the sugar lecture. That’s wrong. I agree. Fruits contain natural sugars. And they have lots of fiber and that helps regulate sugar levels in the body. Very informative article on the topic. We’re vegetarian, so I bring a lot of fruits and vegetables. Fruits is a part of our daily diet and I give it in lunch for office to my husband, for two sons and to daughter in-law.